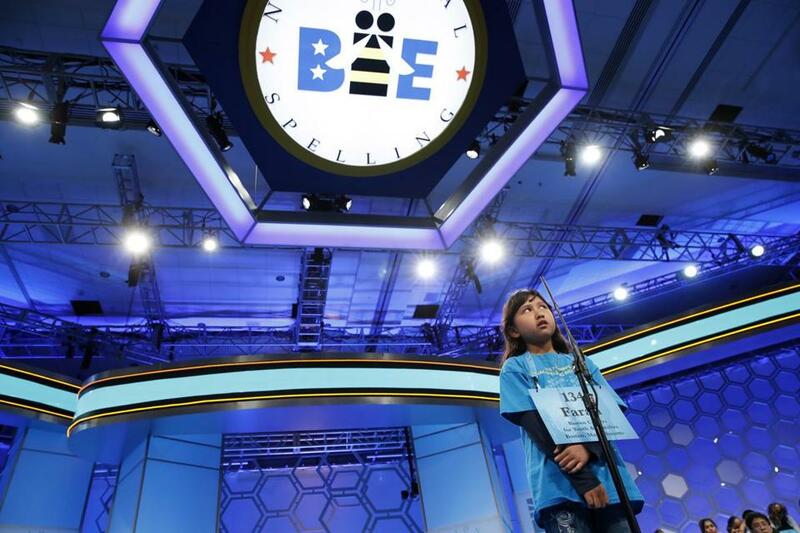 Farah Haniff, 10, of Brighton, competed in the 90th Scripps National Spelling Bee in Oxon Hill, Md. on Wednesday. Farah Raslan Haniff, a fourth-grader from the Winship Elementary School in Brighton, made it to the third round in the Scripps National Spelling Bee before being eliminated from the finals. In March, she won Boston’s citywide spelling bee by spelling “cacophony” correctly. She competed in the second round of competition Wednesday morning. The third round started in the afternoon, and the finals are scheduled to take place Thursday. Entrance into the finals is based upon a total point system, her mother, Azna Zaini, said. Farah correctly spelled words in rounds two and three. But finalists were required to have 29 points, and Farah did not have enough points. In a telephone interview Wednesday evening, Zaini was optimistic about Farah’s performance. The Winship school librarian, Aaron Noll, was live-tweeting the event from D.C. using the Twitter handle @AaronGNoll. Noll reported she was back onstage at 1 p.m. to begin the third round. “The entire unabridged Merriam Webster dictionary is fair game for Round 3!” he tweeted. Her father, Raslan Rashid, said there were 291 spellers competing in the bee, and there were plenty of parents, family, and relatives there to cheer the young contestants on. It was “quite a cheerful and lively atmosphere,” he said in a telephone interview. Farah correctly spelled “collocutor,” he tweeted shortly after 3:30. We are currently in Round 2 of the spelling bee. It is not automatic elimination. Emily Sweeney can be reached at esweeney@globe.com. Follow her on Twitter @emilysweeney.